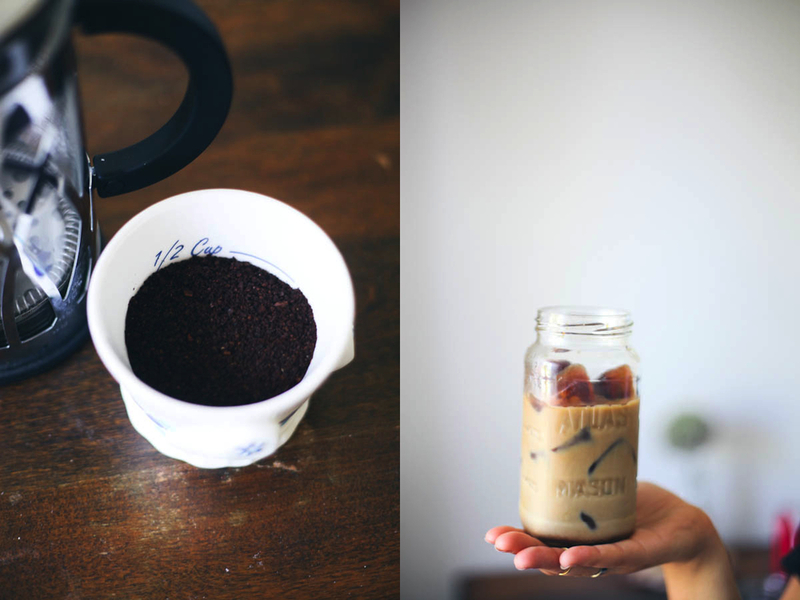 This is really, really great iced coffee. I don't know about you but in the hot Summer months, I love my coffee over ice, especially for that afternoon second cup of coffee, it's just perfect! This method of iced coffee is brilliant because of the way that you steep the coffee, you use cold water, so it doesn't have that bitter taste come out of it that you get when you chill coffee that was brewed hot. In a french press add the coffee and cold water, do not press it until it has chilled for at least 12 hours, put the unpressed french press in the fridge to chill. I usually do this the night before so it's ready for the next day. Press down and you can either drink it that day or it will keep fresh for 3-4 days. The coffee with be rich and concentrated, perfect if you like very strong coffee, or you can add 1 part water or milk to 1 part concentrate, drink over ice!